Challenging an era where women struggled to obtain a foot hold in the elite and educated coterie, Charlotte Angas Scott overcame society's disapproval by emerging as one of England's first women to obtain a doctorate in mathematics. The late nineteenth and early twentieth centuries encompassed an era in which society viewed the woman's place to be in the home. However, Charlotte Scott felt the importance of seeking equality for women, and she was able to accomplish her endeavor faced with a lifetime of challenge. Successful in her aspirations, she is considered to be a pioneer for advancement of women's role in the field of mathematics. Charlotte Angas Scott was born in England in 1858. She was raised in a family of "Nonconformist Christians" who advocated reform, as well as the education of women (Kenschaft, 98). Her early interest in mathematics was sparked by her father who was able to provide her with math tutors at the young age of seven. Charlotte was able to be tutored only because her father held the prestigious position of President of Lancashire College (Kenschaft, 98). During this time, very little formal secondary education was open to females, and no college in England would accept them. Charlotte, the second of seven children, was extremely fortunate to be raised in a home where her parents urged her not to be restricted by "the iron mold of conventionalism" (Kenschaft, 98). Merited for her home tutoring, she won a scholarship in 1876, at age eighteen, to Hitchin College. This was the first college in England to offer a post secondary program. Not long after the college was established, it was renamed Girton College and moved to three miles from Cambridge University (Kenschaft, 98). Four years later, in 1880, Charlotte competed in the final examinations offered at Cambridge, the "Tripos" exams. Mastery of the Tripos exams deemed one qualified to receive a bachelor's degree with honors (Osen, 157). Previously, the honor was awarded exclusively to male Cambridge students. Charlotte's performance on the exam ranked her eighth amongst all the men in the university, yet she was not allowed to attend the awards ceremony solely because she was a woman. Charlotte did not let the "insult" discourage her, but instead she was inspired to work even harder. She went on to receive her Bachelor of Science degree in 1882, and by 1885 had earned her doctorate. Both of her degrees were of the highest possible scholastic rating, "First Class" (Kenschaft, 102). She received her degrees from the University of London; it was not until 1948 that Cambridge would finally award degrees to women. Yet, the effects of this major accomplishment in a male dominated field did not go unnoticed; it marked the beginning of an action which resulted in all resident women being able to take Cambridge examinations in addition to having their names announced publicly with the men (Kenschaft, 102). Charlotte remained at Girton College where she taught for four years. At the end of her fourth year, Charlotte was presented with the opportunity to teach at Bryn Mawr College in the United States. She had received very high recommendations and was one of the first to be offered a position. Charlotte eagerly decided to leave England and accept the teaching position. She saw a land filled with opportunity awaiting her. It was only a matter of time before Charlotte set many mathematical precedents at the college. Her list of accomplishments include setting the admission requirements in 1885 for Bryn Mawr College in arithmetic, algebra, and plane geometry (Kenschaft, 104). She urged the college to administer an entrance examination which was finally instituted in 1901. She established policies as Chief Examiner in 1902 and 1903 that are still in effect. Charlotte wrote a book entitled An Introductory Account of Certain Modern Ideas and Methods in Plane Analytical Geometry which was first published in 1894, reprinted thirty years later [Preface], and still widely used (Osen, 157). Additionally, over thirty of her papers were published in the American Journal of Mathematics. 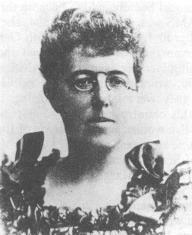 In 1899 she became the co-editor of the journal, a position which she held until 1926. She received an acclaimed review from the American Mathematical Society (AMS) in 1896. Charlotte also served as the first woman on the first Council when the AMS began in 1894. She and her first Ph.D. student were two of nine women among a 250 AMS membership. She again served on the AMS Council from 1899 - 1901 and in 1905 she became the vice-president (Kenschaft, 105). In the forty years that Charlotte Angas Scott spent in the United States she had attained a lifetime's worth of success. She had inaugurated the undergraduate and graduate programs in mathematics at Bryn Mawr, published a graduate text, authored over thirty papers that were published in journals all around the world, and served both as a member as well as held office in several mathematical societies and organizations. She was the first British woman to receive a doctorate in mathematics and was the first mathematician at Bryn Mawr College. She is credited with being the author of the first mathematical research paper written in the US to be widely recognized in Europe, "A Proof of Noether's Fundamental Theorem," Mathematische Annalen, Vol. 52 (1899) [Abstract]. Charlotte retired at age sixty-seven. She returned to England and lived there until 1931. Under her guidance, women began to assume a more active role in the mathematical society. "The number of women in mathematics was increased during the nineteenth and twentieth century by European women who were interested in careers in mathematics and science and came to America as part of the 'migration of mathematicians'" (Osen, 154). In essence, Charlotte inspired the radical challenge for women to pursue a career in mathematics. Read the article about Charlotte Scott written by Isabelle Maddison for the Bryn Mawr Alumnae Bulletin. Osen, Lynn M. Women In Mathematics, The Massachusetts Institute of Technology Press, 1974, 156-157. Kenschaft, Patricia. "Charlotte Angas Scott," in Women of Mathematics: A Biobibliographic Sourcebook, Louise Grinstein and Paul Campbell, Editors, Greenwood Press, 1987. Kenschaft, Patricia. "Charlotte Angas Scott," in Notable Women in Mathematics: A Biographical Dictionary, Charlene Morrow and Teri Perl, Editors, Greenwood Press (1998), 219-224. Kenschaft, Patricia and Kaila Katz. "Sylvester and Scott," Mathematics Teacher, September 1982, 490-493. Kenschaft, Patricia. "Why did Charlotte Scott succeed? ", AWM Newsletter, Vol. 17, No. 2 (1987), 4-9. Lehr, Marguerite. "Charlotte Angas Scott," in Notable American Women, 1607-1950, Belknap Press of Harvard University, 1971, vol. 3, 249-250. Photo Credit: The larger photograph used with permission of the MAA Committee on Participation of Women and is taken from Winning Women Into Mathematics, published by the Mathematical Association of America, 1991.